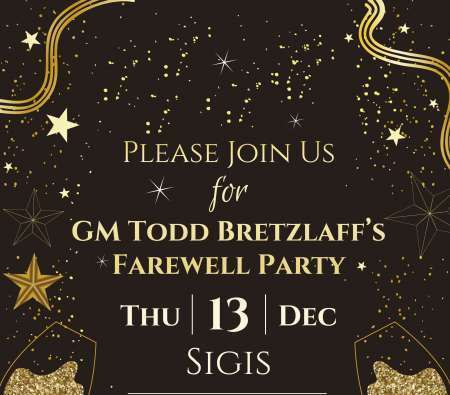 We warmly invite you to our General Manager – Todd Bretzlaff’s Farewell Party on December 13 at Sigis Restaurant from 5:30 PM to 8:00 PM. The event will be a complimentary cocktail party with drinks and hors d’oeuvres to send our best wishes to Todd. He has been an indispensable part of the ACC family for the past eight years. Todd has truly devoted himself wholeheartedly to the Club and the Members. Much of what we love about ACC today has been the result of Todd’s tremendous efforts over the years. Todd’s presence at the club will be sorely missed – whether he was greeting people in the lobby, walking through the Club monitoring all of the activities or standing to the side as the Club’s unofficial photographer. We would love for you to join us on this very special occasion and help show our appreciation to Todd for everything he has done for the Club.